1. Make a contract. This is the most basic step you can take to avoid dangerous situations – and arguments! – later. Explain to your kids what is expected of them: maybe it’s doing chores before using the computer, or maybe they can’t use phones at dinner. You should also explain the importance of never giving out personal information online, and that there are certain sites that they can’t visit. Then set up a filter to make sure they don’t go there accidentally. 2. See what they’re using. 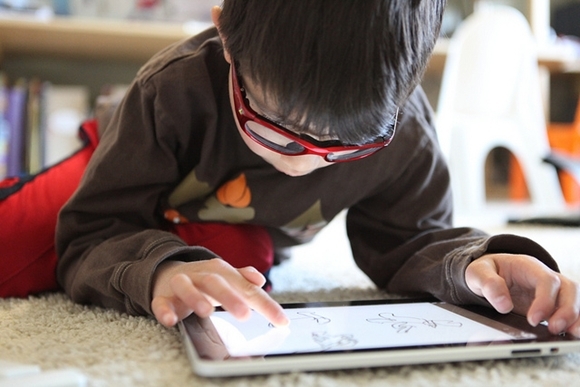 Even innocuous sites and apps can actually be riddled with danger, so make sure you’re taking the time to check what exactly your kids are doing online. If they are on the computer, it should be in a public place! If they’re using an iPad or other tablet, open each of the apps and make sure you understand what each one does. 3. Limit access. You can set up your child’s phones, tablets and computers with you as the administrator, meaning that only you can approve downloading new apps. You can also manually set permissions on your child’s phone (both iPhones and Android!) to control which phone functions your child has access to, if you for instance don’t feel comfortable with them using the camera. 4. Check their online “friends.” Okay, this one might be more geared to all of you with teens and tweens out there. A lot of the apps our kids use have flexible privacy settings and allow for unsolicited messages, like this mom whose daughter had a stranger asking for “modeling” shots on the app musical.ly. To check, ask to see your child’s “personal” or “direct” messages in an app, and discuss what they should do if a stranger contacts them. 5. Consider monitoring. This should be your last resort, but there are several types of software to track what your kid does online, who they’re talking to and what’s being said. While this might help you sleep at night, ultimately the best defense is to communicate honestly with your child about the dangers that are out there and how to avoid them. Guest article written by: Amy Scholl. Cyber Safety Consultant at KidGuard Services. Dedicated to finding the best child safety measures for parents, grounded in research. Being knowledgeable about youth online usage is a key component of effective 21st century parenting.